I will go to almost any lengths to avoid flying in or out of Charles de Gaulle airport in Paris, which commonly goes by the moniker Roissy. Granted, there were two things I used to like about it. The first was watching how the French passengers all lit up cigarettes about 30 seconds after disembarking from the airplane in calm defiance of the non-stop “no smoking” announcements that accompanied the click and churn of the baggage carousel (when it was actually working, that is). Nothing to me signified Bienvenue en France quite like it. The second thing were, of course, those glass tubes that ferried plane passengers through the airport like extras in an episode of “The Jetsons“, or “les Jetson” I suppose I should say. However, the ultra strict (many French would say “oppressive, pseudo-American, and unlibertarian“) smoking fines have now finally all but eliminated the defiant smokers of Roissy, and the fact that parts of the terminals have begun to collapse has made riding the glass tubes a little more dangerous than I am comfortable with as a mother of three. Otherwise, Roissy does not have much to recommend it. It is filthy, constantly overcrowded, singularly lacking in amenities (notably toilets – especially clean, free ones). It also boasts one of the most depressing, impossible-to-use underground parking lots that I have ever witnessed. I sometimes wonder if among the many homeless people one sees wandering about down there, there is not a handful of travellers who have been lost in the disorienting rabbit warren parkades of Roissy for years, unable to find their voitures. 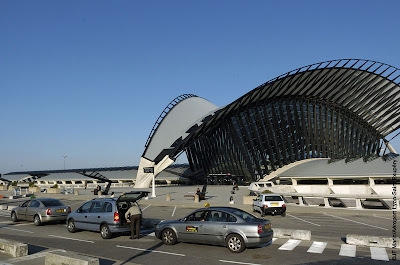 For several years now we book our flights in and out of Lyon’s Saint Éxupery airport, which believe me, is a VAST improvement. Not only is Lyon’s airport named a very cool name – Saint Éxupery after the author of the iconic “Le Petit Prince” – but it is also very clean. Moreover, it has lovely toilets. This is always a big selling point for me – mother of two big girls with small bladders. They are going to kill me for writing that when they are older. Saint Éxupery is all but located in the middle of the fields on the outskirts of Lyon, so driving to and from the airport is an easy and traffic free dream. There are also a lot of sunflower fields to admire en route, which is an edifying change from the graffiti around the péripherique in Paris. I have never experienced any air traffic bottlenecks flying into Lyon. In Paris, it was the rule rather than the exception. I loath holding patterns; all that going up and down invariably makes my head feel like it’s going to explode, so this is a big selling point for me as well. The only tip I would have is to make sure you have lots of 1 Euro coins or jétons in your pocket for the luggage carts (but unlike Roissy, you can at least find a luggage cart in Lyon’s airport). Although Lyon has a very progressive airport, we are still in France, after all. This entry was posted in Authentic France Travel Tips on July 28, 2009 by admin. As you can watch above (just hit the “play” button on the screen), I was serious about the Edith Piaf songs being an integral part of any self-respecting July 14th celebration. So throw on your “La Môme” soundtrack or haul out your accordion and revel in your Frenchitude. This entry was posted in Snapshots of French Life on July 27, 2009 by admin. We got a true Republican send-off two days before we left France. Despite the fact that we still had tons to do and very little time to do it, we wouldn’t have considered missing Villers-la-Faye’s annual 14th of July celebration. The 14th of July – or Bastille Day as it is also known – bien sûr celebrates the storming of the Bastille that heralded the start of the French Revolution. All over France the day is an opportunity to drink some wine, eat good food, and sing Edith Piaf songs. Here is Camille at our seat under the tent that they set up on the Place de salle des fêtes. He we are serving up a magnum of Hautes-Côtes 1993 that Jean-Francois Bouhey, one of Villers-la-Faye’s wonderful winemakers, brought along for everyone to enjoy. And here are the big girls, happy after their face-painting, duck bobbing, rifle shooting free-for-all. Last but not least is the background noise of pétards, or little fireworks, going off all day long. And I ask you – who, young or old, doesn’t like to set off fireworks? So, no matter where you happen to be on the globe for the next July 14th, stop and drink a glass of wine with friends, or eat something delicious, or make some gratuitous noise. I believe that there is a little bit of Frenchitude in everyone. Like so many things in life, it just begs to be celebrated. Bastille Day is the perfect opportunity. As for me, I’ll be in Villers-la-Faye on July 14, 2010. How could I possibly be anywhere else? This entry was posted in Frenchitude Fridays, Snapshots of French Life on July 24, 2009 by admin. This entry was posted in Uncategorized on July 23, 2009 by admin. Thank goodness au revoir means “until we see each other again” and not good-bye. This entry was posted in Snapshots of French Life on July 11, 2009 by admin. Older children left to fend for themselves like Gavroche and other orphan children under the bridges of 19th century Paris with only a sprinkle of water. On days like today when I have a million move-related things to do and a 17 month old who has decided to give up her naps, this whole trans-Atlantic lifestyle thing doesn’t seem like such a good idea after all. This entry was posted in Snapshots of French Life on July 9, 2009 by admin.